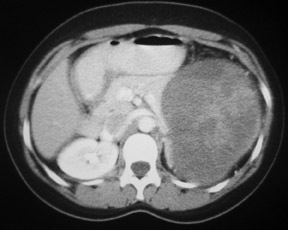 Enhanced CT imaging of the abdomen revealed a large, well circumscribed, heterogenous pancreatic tail mass measuring 13 cm in greatest diameter (Figure 1). The mass splays the pancreatic body-tail junction creating a “claw sign” within the pancreatic parenchyma suggesting pancreatic tail origin. The mass displaces the left kidney inferiorly (Figure 1A). The left adrenal gland is clearly separate from the mass which compresses the adjacent gastric body medially (Figure 1B). 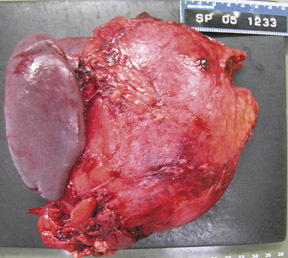 SPEN of the pancreas is treated surgically and complete resection of the mass is usually curative. However, malignant degeneration has been reported in ≤15% of cases including local invasion or metastasis.3,4 Thus, this tumor is probably best classified as a neoplasm of borderline malignant potential. Differential considerations including nonfunctioning islet cell tumor, pancreatoblastoma, and complicated pseudocyst are less likely possibilities. Nonfunctioning islet cell tumor may also be incidentally identified as a large mass with local mass effect on adjacent structures. However, nonfunctioning islet cell tumors typically occur in an older patient population and are most commonly located in the head, neck or uncinate process. Pancreatoblastoma is a rare pediatric carcinoma of the pancreas in which the majority arises in the head of the pancreas. 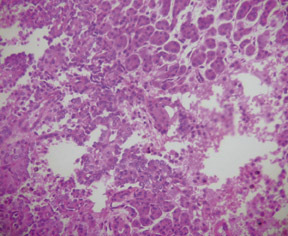 Elevated alpha-fetoprotein may also be an indicator of pancreatoblastoma. This diagnosis is unlikely given the location and unremarkable laboratory findings. Finally, the diagnosis of complicated pseudocyst is also less likely in this young patient without a history of pancreatitis. Clinically, patients with SPEN are asymptomatic and diagnosis is made incidentally by diagnostic imaging. Laboratory evaluation often reveals normal serum amylase and lipase. Markers for pancreatic cancer including CA19–9 and carcinoembryonic antigen are typically unremarkable.6 When patients are symptomatic they may present with a slowly enlarging upper abdominal mass or vague abdominal pain and discomfort. If the tumor becomes large enough to compress and displace the adjacent visceral organs, the patient may complain of obstructive symptoms. Differentiating SPEN from other pancreatic neoplasms can be difficult as the imaging characteristics of pancreatic neoplasms may often be nonspecific and overlapping. However, SPEN should be the primary differential consideration in cases where the classic imaging characteristics and location are present in a patient with the appropriate demographics. Specifically, a large sharply marginated heterogenous mass within the pancreatic tail of a young female should prompt SPEN as a primary diagnostic consideration. The diagnosis of solid and papillary epithelial neoplasm carries an excellent prognosis with surgical resection. SPEN should be a primary differential consideration when a large, well defined, heterogeneous pancreatic tail mass is encountered in a young Asian or African American female. Franz VK. Tumors of the pancreas. In: Atlas of Tumor Pathology: fasc 27–28, ser 7. Washington, DC: Armed Forces Institute of Pathology, 1959;32–33. Ohtomo K, Furui S, Onoue M, et al. Solid and papillary epithelial neoplasm of the pancreas: MR imaging and pathologic correlation. Radiology. 1992;184:567–570. 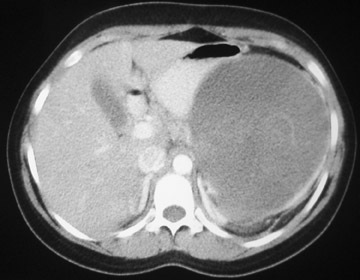 Lam KY, Lo CY, Fan ST. Pancreatic solid-cysticpapillary tumor: Clinicopathologic features in eight patients from Hong Kong and review of the literature. World J Surg. 1999;23:1045–1050. Nishihara K, Nagoshi M, Tsuneyoshi M, et al. Papillary cystic tumors of the pancreas: Assessment of their malignant potential. Cancer. 1993;71:82–92. Dong P, Lu D, Degregario F, et al. Solid and papillary neoplasm of the pancreas: Radiological-pathological study of five cases and review of the literature. Clin Radiol. 1996;51:702– 705. Coleman, KM, Doherty, MC, Bigler, SA. 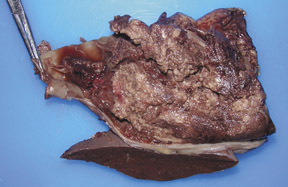 Solid-pseudopapillary tumor of the pancreas. Radiographics. 2003;23:1644-1648. 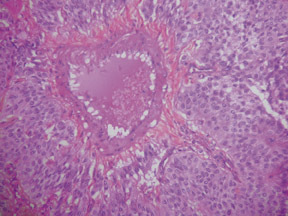 Solid and papillary epithelial neoplasm of the pancreas. Appl Radiol.